An architectural detail on the Sears store. Around fifty BHP members, Bernal residents, and other curious San Franciscans crammed into the Bernal Heights Library's downstairs meeting room for a fun and informative talk and slide show on the city’s earthquake shacks presented by guest speaker Woody LaBounty of the Western Neighborhoods Project, followed by a lively group discussion. 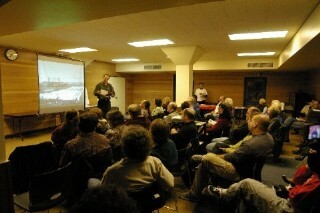 Woody showed a series of slides depicting the history of earthquake shacks in San Francisco. Immediately after the 1906 earthquake and fire, tented refugee camps for those made homeless sprang up across the city in parks and other public spaces. (In our neighborhood, this included Precita Park and Dolores Park.) As winter approached, city authorities realized that sturdier forms of shelter were needed, and so around 5,600 cottages, or shacks, were quickly built by union carpenters in three sizes designed by the US Army. The shacks were very basic one-roomed wooden structures without plumbing or heating and were intended to be temporary. Residents paid a minimal rent and had to obey military-style rules against peeking, drunkenness, and misbehavior in the camps. After about a year, the camps began to close -- some people took their shacks with them, often heading west to the Sunset and the Richmond districts where land was available. Jane Cryan, the undisputed SF expert on earthquake cottages (her unpublished book, Hope Chests, can be found in the main library's History Center), was also at the talk and told the audience that she has identified 21 surviving shacks in the city -- but there could be others. Bernal Heights Preservation now needs to borrow from Woody and Jane's research and continue the search for shacks in our neighborhood. Jane's book confirms that 20 Newman and 164 Bocana are genuine surviving earthquake shacks, but there must be more! Jane and Woody haven't yet authenticated any others in Bernal, but we suspect there are ones on Carver, Anderson, Newman, and Mullen streets, as well as others that have been subsumed into larger buildings. There are three distinct types of shacks with very specific measurements and external features; there are small houses in Bernal that look like earthquake shacks and were built around the same time, but aren’t specifically refugee shacks from the camps. Ellsworth and Cortland streets have a number of small cottages – can we identify them all?